The Design Piracy Prohibition Act is back in the news again. The proposed law was drafted to extend copyright protection to cover design (and not just print, pattern and surface design, which are already covered). A team of designers and representatives of the Council of Fashion Designers of America recently trekked to Washington, D.C., to urge lawmakers to reintroduce the bill, which was first introduced by U.S. Rep. Bob Goodlatte (R–Roanoke, Va.) in 2006. The CFDA and its president, Diane von Furstenberg, have been highly visible supporters of the proposed legislation since the beginning. If you want a little more background, California Apparel News has been covering the law’s progress, including covering the views of the proposed law’s supporters and its opponents. Clearly this is a controversial issue with plenty of persuasive arguments on both sides. This morning I received an e-mail alerting me to the latest wrinkle, which is chock full of irony. 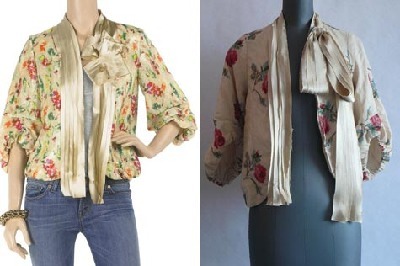 A Canadian newspaper asked Jennifer Halchuk, co-designer of Canadian brand Mercy, to examine a Diane von Furstenberg floral jacket from the Spring ’09 collection. The DFV jacket bears a striking resemblance to one by Halchuk from Mercy’s Spring ’08 collection. Halchuk said the similarities go beyond the slightly similar floral pattern and the silk sash with an asymmetrical bow. The designer points out similarities in sleeve treatment, including identical darts at the elbow and elasticized hem, as well as a similar drawstring treatment inside the jacket. The Counterfeit Chic blog, which is run by Fordham law professor Susan Scafidi, brought the matter to von Furstenberg’s attention. Apparently the legendary designer was “horrified” with the news. It looks like copyright is going to be a hotly debated issue again this year. What do you think? Design piracy or fashion inspiration? Does it matter in today’s challenging economy? Or does it matter more than ever?